This is a cut and paste activity Students begin by cutting the bottom strip off of the paper. The students then cut the five words/pictures out and match each one to its antonym. Students then glue the antonyms in the correct box. Boardmaker pictures are used to simplify the definitions for students with special needs. This is a good worksheet to use in the general education setting for students who require a differentiated activity or for students in a self-contained setting. 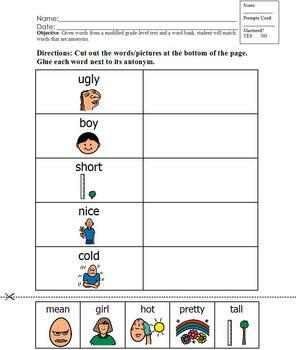 Worksheet would also be excellent for general education Pre-K through possibly grade 2.